As one of Sony's 'V' series, the KDL-32V2000 sits squarely in the middle of the brand's current, widely acclaimed Bravia LCD TV range, which means two key things. First, it looks very elegant, thanks to a cunning combination of matt black offset by spots of shiny metallic trim. And second, it's got a significant step-up feature over Sony's 'S' entry level models in the shape of Wide Colour Gamut (WCG) technology. This applies a new phosphor/backlight combination so the TV can produce a significantly greater colour palette. Other key innovations common to the KDL-32V2000 and all the other new Bravia LCDs include the Bravia Engine image processing system (designed specifically for LCD technology) and Super Vertical Pattern Alignment pixel technology, allowing you to watch the picture from a wider angle. With the digital tuner backed up by the customary full suite of Electronic Programme Guide/subscription channels functionality, and such sophisticated picture tweaks on hand as black correction, contrast enhancement, gamma adjustment, and MPEG noise reduction, there's only really one crack in the KDL-32V2000's otherwise exemplary early impressions: just the one HDMI jack. Still, this becomes easy to forgive when we see how sublimely the TV handles Million Dollar Baby from Sky HD and DVD. Particularly eye-catching is how staggeringly sharp the picture is, letting you make out every tiny detail of the crowds watching Maggie's fights, and every minute texture of the shabby walls of Frankie's gym. Colours are also outstanding. The WCG system ensures the film's rare bright, rich scenes, like where Maggie shows her mum a new house, look stunningly vibrant. But even more importantly, the wide variety of tricky skin tones on show in the often low-lit setting of the gym are all handled with complete authenticity and subtlety. It does no harm to the colours' chances, either, that they're allowed to strut their stuff against some impeccable black levels. This helps the picture exhibit exceptional scale too - especially given that the set's greyscale capabilities are also outstanding. Throw in on top of all this a perfectly judged white balance, practically no noise with standard or HD footage alike, and more than respectable motion handling, and you really have got one deliriously great picture. The KDL-32V2000's audio is almost as impressive as its pictures. It's hard to believe such a combination of treble clarity, midrange openness and rich, full bass could come from speakers as skinny as those of this Sony - but our ears don't lie! 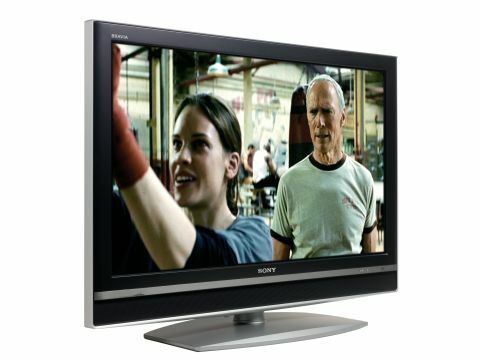 At £1,300 the 32V2000 is hardly cheap for a 32in LCD TV. But if you want the best, sometimes you just have to pay for it, and this Sony justifies the fiscal outlay.